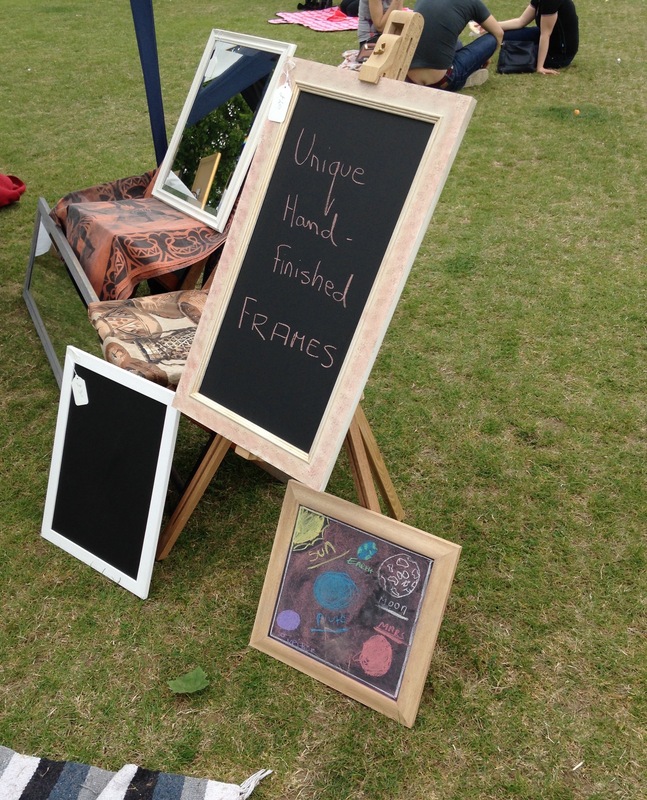 In the world of bespoke framing – who is my customer? It occurs to me that given my past, I should have written more than 1 blog entry between “Welcome to 2017!” and today, early March 2019. This is especially true given that my ‘previous life’ was all about writing blogs and keeping my customers informed. My only excuse is that as much as I have wanted to write (I do love the writing) and keep you informed, some of the delay in this post is that I am not quite sure who my customer is. (Gasps of shock, I hear, from all those in business who say it’s important to know exactly who your customer is) So maybe more precisely should be to say, who are you, my reader? Let me tell you why. a client who comes once a year for a workshop. Each year she contacts me with a new project or idea and we spend the day working on that new skill. This year we donned aprons and I showed her how to paint and finish the frames she made to her specification. I’m looking forward to next year! a client who has done the basics and wanted to revisit them, with a view to becoming a framer. Actually, there have been a few of these over the years and a few since the start of the year. 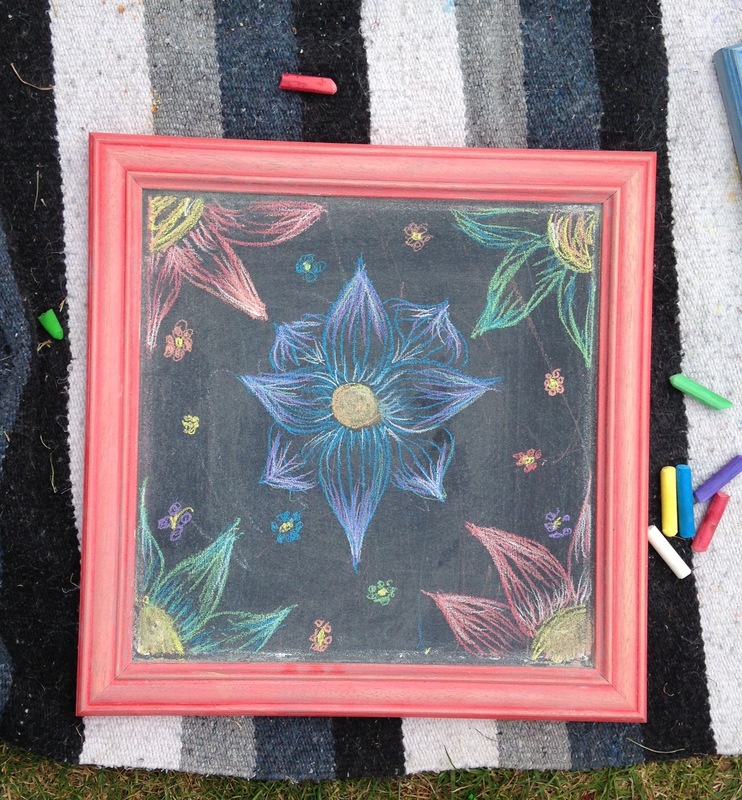 One who is tentatively exploring the idea of starting framing as a business, one who is methodically increasing her skill set and one who bought the professional tools, jumped in at the deep end and who spent a few days with me, getting to know the tools. I’m looking forward to seeing him back to learn more. 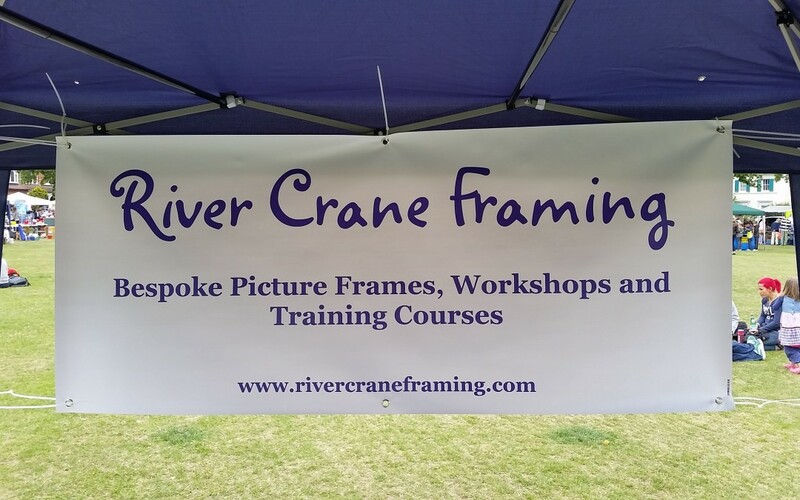 a client who has completed quite a few framing workshops and who, over the years, has wanted to add very specific skills to his repertoire. This year he booked two consecutive days and we worked on stretching canvases, lacing fabrics and making a box frame. two friends, who have been friends forever, but rarely see each other. For them a one-day framing workshop is a lovely opportunity to spend a day together, have fun, learn something new and take home something they have made from scratch. a mother and son duo who wanted to learn to frame silk scarves – I think we’re all still learning that one. Silk is not easy to work with and silk scarves can be a challenge. a morning workshop, which was a gift for a friend who has a special achievement. What a wonderful encouragement from a friend. As if she said “Go and frame your medal, photograph or certificate – be proud of your achievement and and cherish that memory”. an introduction to framing workshop as a surprise gift for a husband to spend the day learning something new. Not often I can stand inside the frame! I think I mentioned in my last post back in 2017, that I love my job. I still do. Are you my customer? I hope so. I’m not committing to writing another blog any time soon, but if I do, I plan to write about some of the projects I work on and if you’re learning to frame, maybe the articles will be of help. If you’re not learning to frame, maybe there is that piece in the attic you’ve been meaning to get framed and never got around to. Just like my customer who found an old water colour when she was sorting out things and it turned out to be quite valuable. We have framed it with care. It’s January 2017! Apart from stating the obvious, that yet another new year has rolled in, I’m writing to thank my customers and friends for a great year in 2016. I have a friend who often says “I’m blessed; I like my job”. It’s not something you often hear. Many have to fight the grind of getting into the city, with rail strikes, tube strikes, poor weather conditions or sheer volume of people on the journey, that’s London for you! I love my job, because it’s a whole new experience – every day! The reason? I meet new people and see different artwork or am asked to frame something new and unusual each day. Every piece that is brought in is special to that person, either because it’s a recollection of a holiday or a person or an experience, or it’s a gift or it’s going to be sold. Whatever the reason, the person and the artwork are linked and I have the privilege of sharing that experience while I hear the story and frame the piece. Isn’t that a treat? So this is a thank you to all of you who brought your art to me for framing and also to those who chose to spend a day (or more) on a training workshop with me in my space. Thank you. If you’ve not yet been, please call and make an appointment to pop in and visit the workshop. I look forward to meeting you. Have a great 2017. All set up and ready! 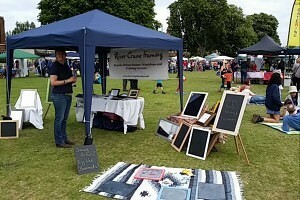 Monday, 25 May 2015, the HANDS Charity Fair was held on Twickenham Green. 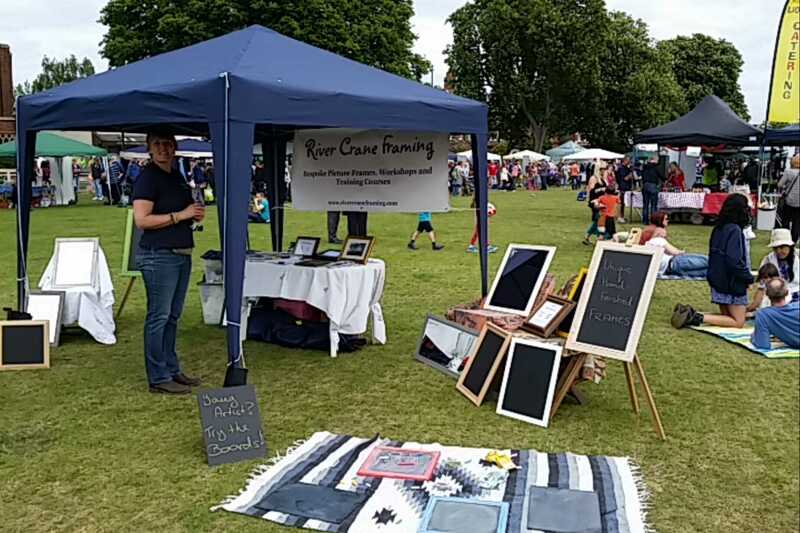 The organisers offer a few places to local crafters and so River Crane Framing made its debut visit. We thoroughly enjoyed the day and hope it’s the first of many with HANDS. I was interested in meeting locals and for them to know about us, so I framed a few blackboards and mirrors. 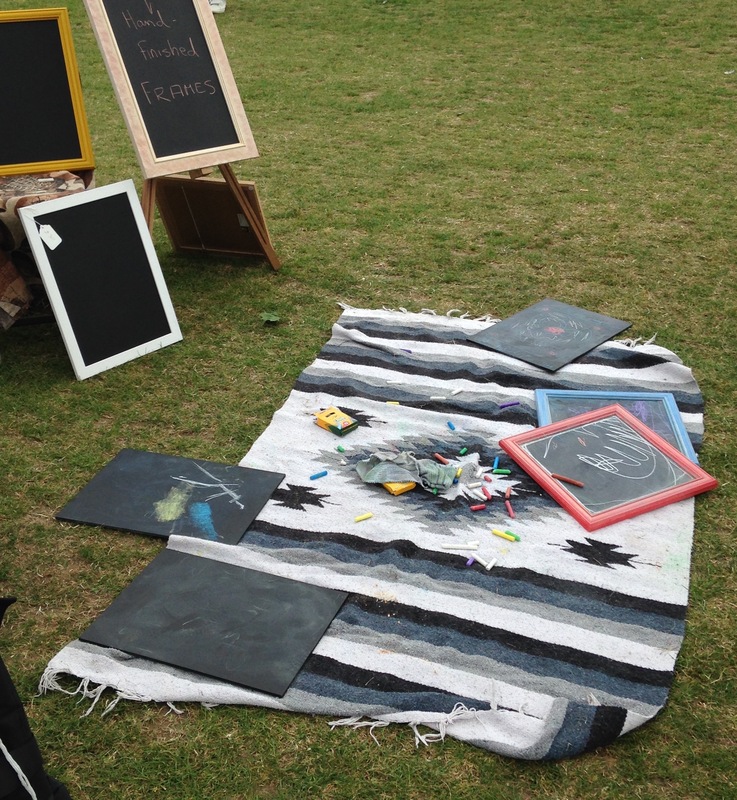 The fair attracts a lot of local families (if the weather is good), so I thought a few blackboards and a little chalk might be fun, and it was! The kids loved to get down and dusty! 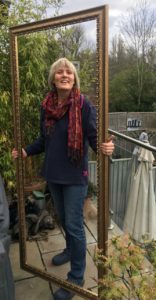 I teach framing to hobby framers and as introductory sessions for those interested in taking framing further. I have now started 1-1 sessions in my workshop, which I have enjoyed and have had great feedback for. We spent the day chatting with folk who stopped by to find out more about what’s on offer. It was a lovely day, we met lovely people and the blackboards were used and used and used! One of my hand finished pieces was bought to be a part of a wedding! How’s that for a fun day out. If you’d like to know more, why not drop me a line or call and book yourself onto a workshop. 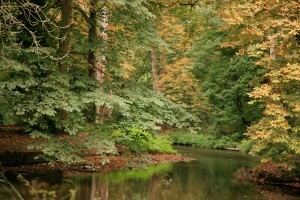 What is conservation framing? Have you ever asked your local framer about different levels of framing? 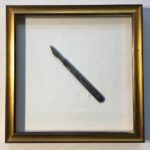 When do you ask a framer to use conservation techniques? The answer generally is when a piece of art has value and you want the framing to protect and preserve the art for a long time. That brings us to the more subtle point; when does a piece have value? Is it price, so there’s a monetary value involved? Is it unique – one of a kind – or perhaps a limited edition? Is it personal, something handmade, special only to the receiver? When it comes to framing, it can be all of these. I have finally framed an etching that I bought in Venice a few years back. The piece of art is hand printed and it’s a limited edition, so has a certain monetary value, but more than this, it’s special to me, because I bought it in Venice, from the artist near St Mark’s Square, on a great holiday. So as I worked on framing it, and now as I look at it, I’m transported back to the holiday, to Venice and the trip. This is true of much of the art we buy or are given; while there may be a large or small monetary value, there is a personal aspect that can be so much more, and so it’s important to take care when framing it, as that can enhance or detract from the piece. 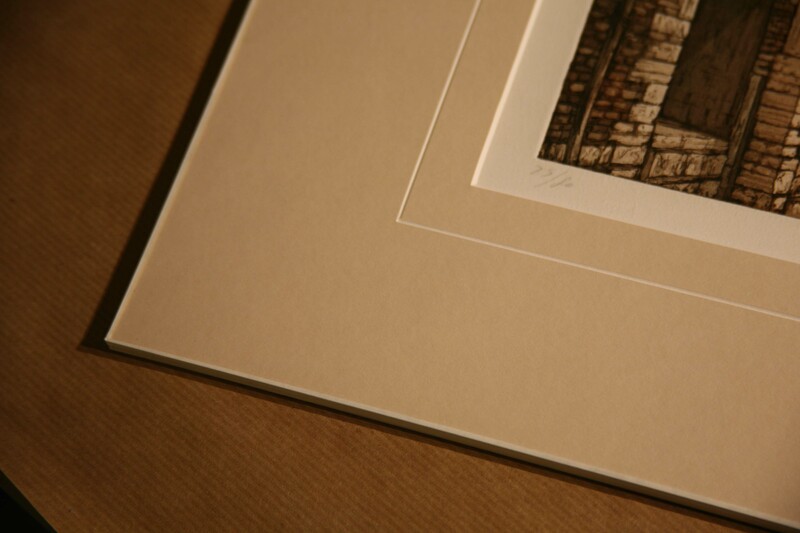 Chat to your local framer. Tell them about the piece, tell them who it’s for and where it’s likely to hang. All this can influence how it’s framed. The first image shown above is the piece of art unmounted and unframed. 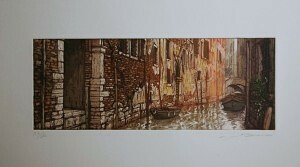 It’s an etching and aquatint (http://en.wikipedia.org/wiki/Aquatint) by Venetian artist, Ugo Baracco. 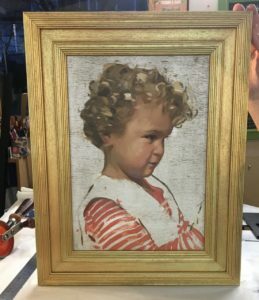 I wanted to use conservation framing techniques and materials so that the work will be protected in its current state for years to come. Also, if the etching is reframed at a later date, anything I have done can be reversed. In deciding on the mount and the frame I didn’t want to add too much clutter, but I did want something a little different and opted for not having a standard black frame. 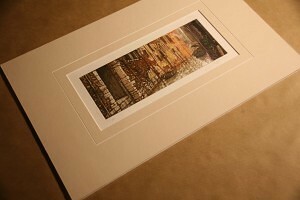 I also like a double mount, as the extra layer adds a depth and the extra mount can give a good edge of colour. However in this instance I used a single mount, with a V-Groove running close to the artwork. I think it adds interest, without a fussiness. I also left the white margin, as this is signed and includes the limited edition details. For conservation purposes, the mount boards used are conservation grade and the print is hinged to the under mount using gummed conservation tape. 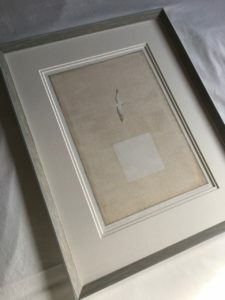 Gummed tape is easier to remove than self adhesive tape, so any work done is easily reversed allowing a framer to undo the lot, without damaging the art, in the future. Glass is a whole other discussion, and for a conservation piece you want to use the highest UV protection you can afford, to reduce the impact of UV light on the work causing it to fade. The final step I like to do is wrap the mounted work, together with the glass and a barrier board, securing them together using conservation tape. In the image on the left, the fine white line is the tape wrapping the bundle. This is not necessarily required for a conservation piece, though some framers insist on it. I like to tape the bundle for a few reasons. The first is that once I have cleaned the glass, it’s great to wrap the bundle and seal it, thus ensuring no bits get in while I’m securing the frame. It’s also easier to work with. Once wrapped, I can drop the whole bundle in the frame and finish it off. The last step is the back! 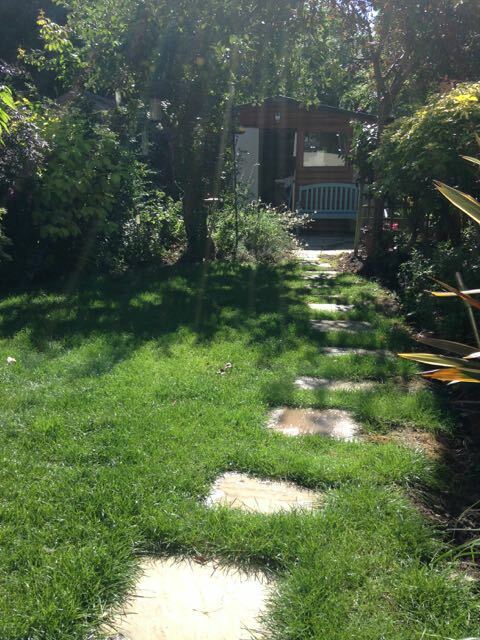 You may be surprised to know that most of my clients look at the back (often first!) I think it’s a natural instinct to turn something over, so it’s good to have a neat finish. 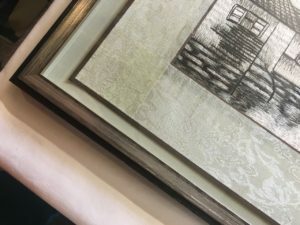 Framers use different tapes to seal the back of a framed piece. For conservation work, I used gummed tape and finish with a paper backing. As described above, the gummed tape is easy to remove; just wet the tape and it’ll lift off. Then to seal the deal, I add a paper backing, which gives a clean neat finish. Looking for a gift for Christmas? 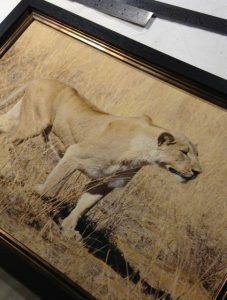 Why not find a special picture, a photograph from a recent holiday or a picture that carries a special meaning and frame it! The next framing class is in Kew, a walk down the road from Kew Gardens station. The weekend is split into two separate days, so come for one or both days. 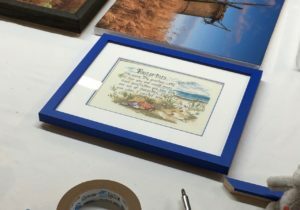 On Sat 8th, we’ll do the basics of framing, starting from scratch, and you’ll leave with that special piece framed – perfect for a special gift. On the second day, we focus on mounts, discussing colours and practise some of the different ways of mounting an image. If you’re not that keen on framing yourself, then why not buy a day of framing as a gift instead? It’s all good fun and everyone who attends leaves with a sense of satisfaction and that great feeling of having achieved something. The Latest Framing Workshops Schedule and the Next Course is Cambridge! The new framing workshops schedule is available on the DIY site, so if none of this year’s dates work for you, get onto it now and book for next year. Don’t be fooled by the availability numbers on the DIY site, drop me a line or give me a call or call DIY Framing directly to find out about availability. I’m teaching in Cambridge in September and there are definitely a few spots available on that, so if you’ve been considering a weekend framing course, then get on it! The last two courses I taught were in Norwich and then in Brighton, both of which ere fun, pretty focused work for the weekends and all those attending went away with great pieces. 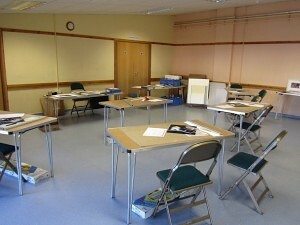 This is the room in in Hurstpierpoint near Brighton, set up and ready for a small group for the mount cutting day. I think people are generally surprised at how much is involved in framing a piece of art. They’re almost always surprised and delighted at the results and amazed at how it’s a pretty busy two days and yet they do leave with a selection of pieces. Just to say thank you for the excellent manner in which you presented the course over the two days. 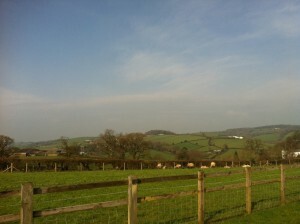 I enjoy the two days training, why not find a course near you and try it? 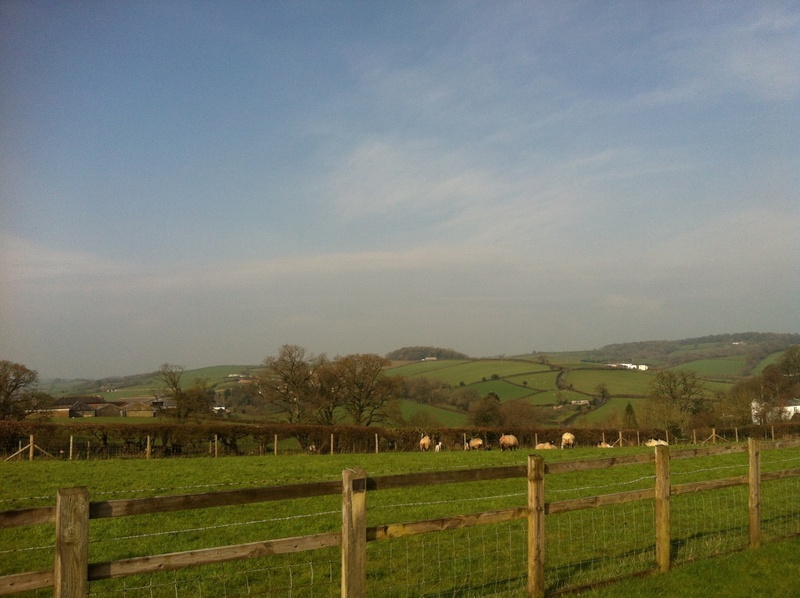 Last weekend I was teaching the Basics of Framing and Mount Decoration in Devon near Exeter – this was the view from my “classroom” in the village hall, so even though we were inside all weekend, the outlook was inspiring, peaceful and perfect for reviving a city soul! When we do the Basics of Framing, we ask the students to bring along an image no bigger than an A4 page. This means that they have a reasonable size piece of artwork to work with, nether too big nor too small, and the glass, cutting equipment and other stock we bring is all suitable. Typically the class is made up of a mix of photographers and artists, and so the range of media varies, providing a lot of interest. 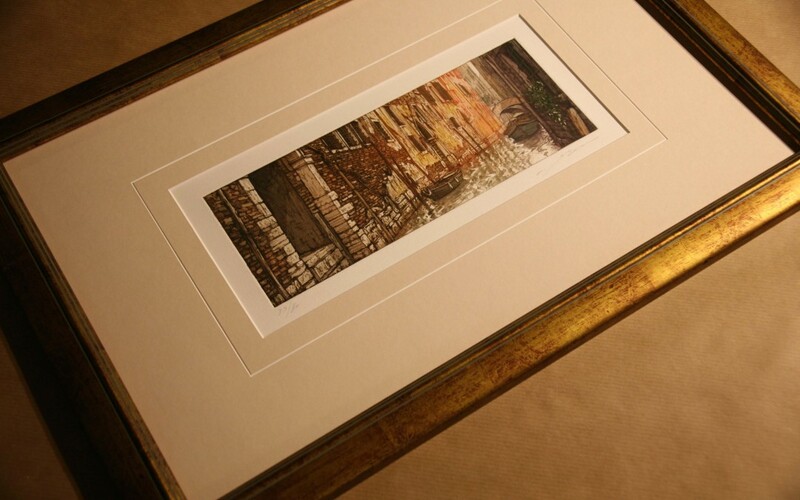 There is much to consider when framing your art including, quite obviously, the frame itself and the mount board. The range of choice available in these alone can leave you baffled for some time, so for the introductory course we do away with choice, and stick to teaching the basics. Even so there are decisions to be made, and the one I’m interested in today is the aperture. The aperture is that part of the image that you’ll see once you have framed the picture. You may think that you want to see all of the picture and for the most part this is true, but you still need to have a small amount of the image under the mount, so that it doesn’t fall through the aperture. Generally we recommend you measure 5mm less than the image to establish the aperture size. Here’s where it’s interesting… if you take a standard size photograph or image to buy a standard size frame, you don’t get much flexibility on what you want to show or hide. When you’re making your own frames, you have complete control. What’s to stop you creating a square aperture for an A4 size image? Think outside the box and never cut the artwork! What should you do if the image is skew or too big? The important thing is that you should never cut the artwork. I advise this even if it’s your own and it’s a photograph that you can get reprinted. It’s a good habit to get into. This question regularly comes up in class and students are keen to trim off the bits they don’t like. This past weekend one of my students had a fab black and white photograph, with a few bits he wasn’t so keen on and having settled on an aperture, wanted to know if he could cut off the rest. We looked at the depth of the border and I showed him that by playing with the aperture size he could hide some of the image he felt was distracting without having to trim anything. By keeping it intact, he was able to change his mind about what he wanted to expose and finally settled on a square aperture with a wide border and the result was a much more powerful piece of work. So don’t be limited by what you can get off the shelf, play with the space and image, and then make a frame to fit the results. Last weekend I headed off to High Wycombe to pick up the DIY Framing van with all the materials and equipment I needed to teach two framing courses; The Basic of Framing and Mount Cutting and Decoration. So many firsts! I hadn’t run either of these classes solo before and it had been some time since I last drove this kind of vehicle. Ridiculously I was more concerned about driving the vehicle – M25, Friday afternoon traffic, finding my way and all that – than I was about teaching and managing the flow of teaching a Basics of Framing course. It was good, I enjoyed the drive and made my way down to Hurstpierpoint, near Brighton to be ready to set up and teach on Saturday. The two courses are offered by DIY Framing as a bundle for Photographers and Artists and can be taken separately or together. In this instance I had 8 students for the basics and 3 for the mount cutting. The great thing about doing the two together is that you get to practice what you learn on day one quite a bit on day 2 and so by the end of the weekend, those who’d completed both days were much more comfortable with the tools ands seem to leave more confident they’d be able to get started when they got home. It’s a great weekend, on day one you do all the steps required to build a frame from scratch, from measuring the art, cutting the mount, moulding and glass, and assembling the frame. It’s very satisfying to leave the class with a completed project, ready to hang on the wall. Admittedly it’s a long day, made easier because it’s very interactive and the class seem to enjoy the progress made and all enjoyed the final results. The second day focuses on cutting mounts. We discuss the impact of colour and dimensions and look at the impact mounts can have on a piece of art. Once again, it’s astonishing to see the impact a simple mount can have on a piece of art and the class all loved this. They left on Sunday with a collection of mounted pieces they were delighted with. I left, shattered and pleased that not too much blood was spilt! Given that we cut glass, use saws and other sharp instruments, this is a real possibility. Back home and I’ve started to review some of the art we have on display. My next project is to frame a few photographs I’ve had enlarged. I have also been given a couple of shirts to frame. These take quite a lot of work and so I may talk you though that at some point. More on the latest projects next time. Another beginning? How many new starts are reasonable? Actually I have found starting again is a challenge. Having enjoyed a successful career in computer technology to switch to something as different as framing pictures has not been as straight-forward as one might think. The challenge in starting again is that it’s effectively starting at the bottom of the ladder again, building skills, establishing a customer base and finding a place to work. Why framing? Throughout my years working in the computer technology, the pervasive thread has been teaching, which I have always loved; the physical activity of working with and teaching a group of people is both exhausting and enjoyable. As a qualified school teacher I taught Mathematics to senior school students, in the commercial sector, working in IT, I taught a variety of subjects to adults from all walks of life and in New Delhi, India, I taught English to children who ages ranged from 5 to 11 years. I’m not sure which was the most challenging – possibly those 5-year olds with their unstoppable energy! Another thread that has run through my life has been my “art”. I’ve done all manner of hand-craft to bring a balance into a life full of technology, including woodwork and photography and even reached the point of selling my photography, with a view to moving into doing that full-time. In a world where every piece of technology has an integrated camera, it’s a hard sell! Around the time, when I was selling my photographs, cards and miniature desk calendars at craft fairs, I started framing my photographs, and loved the act of framing as much as I found joy in taking the photographs – so much more satisfying than the selling. In the years that followed I framed the occasional print and settled back into earning money in the safety of the tech world. In 2012, I started working with wood in earnest again and enjoyed a basic woodwork course and got out the old framing tools, and made a serious effort at turning my shed into a workshop! In the past I had turned the kitchen into a temporary workshop to frame a piece. Having a dedicated space to work meant that I could frame late into the evening without impacting dinner. Throughout the year I framed for friends and gathered others by word-of-mouth. I have enjoyed working with an artists, creating bespoke frames, by matching colours and finishes to bring out the best in the art, photographers and few friends who have dusted down old prints and photographs to hang on their walls. I plan to continue framing this year, and I’ll also be teaching basic framing skills for DIY Framing, on the occasional weekend in the year. 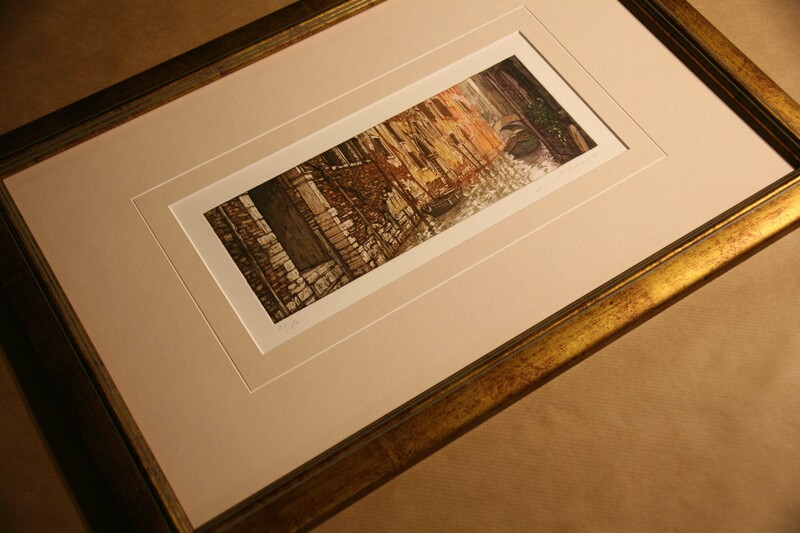 See the DIY Framing – UK School of Framing website for details. River Crane Framing is named to reflect the area where I live and frame, where I walk with friends and the dogs and see the seasons change. If you have something small or large, a photograph, a painting or postcard that you’d like to have framed, have the personal touch, call me.